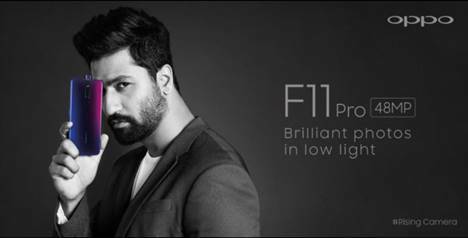 OPPO, a global smartphone brand today launched the #BeBrilliant ad campaign for its recently launched OPPO F11 Pro starring Bollywood's rising star Vicky Kaushal. Amplifying the latest technology by OPPO India, the TVC highlights the new face of exceptional technology in India -OPPO F11 Pro with the new face of exceptional artist in Bollywood – Vicky Kaushal. Equipped with a 16MP rising camera, the smartphone boasts low-light photography and offers a 48MP Ultra-clear camera system to capture stunning pictures in any given setting. OPPO's new TVC encapsulates how the rising camera captures each moment perfectly. The TVC showcases the style statement, attitude and charisma of Vicky Kaushal which is completely in sync with the new OPPO F11 Pro that comes with a stunning design and excellent cameras, which gives its users a brilliant experience. The TVC will go live on OPPO's YouTube, Facebook, Twitter and Instagram accounts supported by the hashtags- #BeBrilliant and #OPPOF11Pro bringing you and your Josh to the next level. Speaking on the announcement, Mr. Charles Wong, CEO OPPO India and President OPPO South Asia said, "We are excited to collaborate with Vicky Kaushal who is one of the most versatile actor in Bollywood today. Within a short span, he has become the rising Bollywood heartthrob who enjoys a huge fan base across India. Just like his journey, OPPO too has offered its latest rising camera technology with the launch of OPPO F11 Pro in India this year. We believe he is the right choice to represent the brand and symbolizes with #BeBrilliant campaign for OPPO F11 Pro."